Black Belt Eagle Scout at Reverb Lounge Sept. 26, 2018. I’m more convinced after last night’s Black Belt Eagle Scout show at Reverb Lounge that the best way to get introduced to a new album is live on stage. Prior to this show the only BBES tune off their new album Mother of My Children I’ve heard was “Soft Stud,” which has gotten some spins on Sirius XMU. It was the first time for the rest of it, presented in a confined space like Reverb without distraction. I walked away wanting to hear most of it again. I say “most of” because the set started rather flat and low-tempo, highlighting the quieter moments on the album. Very pretty, reminiscent to some degree of early Azure Ray or a K Records act. 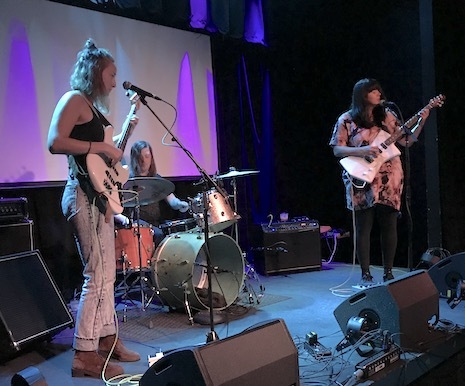 It wasn’t until halfway through the gig that the trio, fronted by singer/songwriter/guitarist Katherine Paul, began to take off. Paul turned up the guitar, stabbed the pedals and roared on a number of songs that would have made Neil Young proud. Pushing everything forward was whomever was playing bass, an amazingly deft and creative bassist who augmented Paul’s work with her own intricate counter melodies. Great stuff, enjoyed by a smallish crowd. I figured it would be packed what with the Saddle Creek connection, but there probably was only around 35 people in the room, which made for an intimate set. Guerilla Toss at Reverb Lounge Sept. 26, 2018. Things didn’t get rolling ’til almost 9:30, which limited my time spent with Guerilla Toss, a six-piece ensemble that sounded like a cross between Tom Tom Club and Siouxsie and the Banshees. Very arty, very progressive, very fun bouncy rock rife with twists and turns and big moments. Frontwoman Kassie Carlson has a soaring voice that cuts through everything going on around her. The only thing missing was a dancing crowd. The big show tonight is Gary Numan at The Slowdown. There’s been a simmering level of excitement since this one was announced months ago, but surprisingly it’s not sold out. For those pondering whether to go, here’s the setlist from Numan’s Cleveland show Sept. 23, which indicates that he didn’t roll out mega-hit “Cars” until about halfway though the show. If you’re like me, that’s the only Numan tune you know. Still, this one could be a lot of fun. LA art rock trio Nightmare Air opens at 8 p.m. $28. Azure Ray are back with a new EP on Flower Moon Records. Azure Ray, the ground-breaking duo of Orenda Fink and Maria Taylor, are back with a new EP. Titled Waves, the album comes out Oct. 26 on Taylor’s Flower Moon label. The first new album by the duo in six years, it will be the first recording since 2002’s November EP not released on Saddle Creek Records. Earlier this year Flower Moon re-released Azure Ray’s self-titled debut and follow-up, Burn and Shiver. The first track, “Palindrome,” dropped today. Check it out below and preorder the double A-side limited edition flexi 7-inch here. No word of a tour yet, but Azure Ray is slated to play an Oct. 26 fund-raiser at the Bemis Center for Contemporary Arts with Destroyer (solo). The new Cursive album, Vitriola, is somewhat epic, maybe the best thing they’ve done since The Ugly Organ. If you don’t believe me, check out the third track dropped from the album, “It’s Gonna Hurt.” And pre-order the mutha from 15 Passenger. The album comes out Oct. 5. Tonight one of Saddle Creek Records’ latest roster additions, Black Belt Eagle Scout, plays at Reverb Lounge. Creek just re-released the band’s debut album, Mother of My Children. They’re opening for headliner Guerilla Toss, a red-hot Boston band that’s been kicking around since 2010, releasing albums on DFA Records, including LP Twisted Crystal, which came out earlier this month. Expect a crowd. $10, 9 p.m.
Another deep weekend of shows. The big one is tonight. 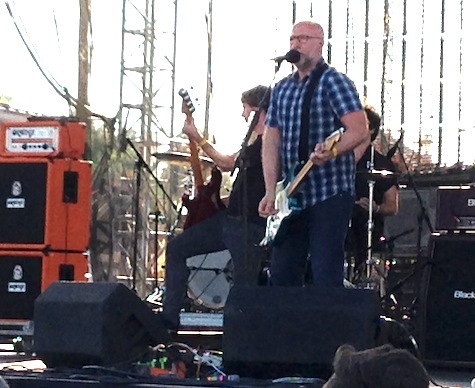 Bob Mould and his band kick of their tour at The Slowdown’s big room. 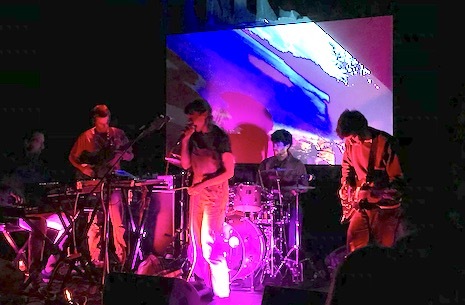 Mould’s supporting his new album, Patch the Sky (2016, Merge), which continues in the same roaring guitar style as 2012’s Silver Age (thankfully). Opening is Minneapolis band Fury Things, who just played some dates with Weezer. Surprisingly, this $25 show has yet to sell out. If you’re planning on going, you may want to get your ticket online. Show starts at 8 p.m.
Also tonight, Boston band Guerilla Toss headlines at Milk Run. The band’s latest album, Eraser Stargazer, was released earlier this year on the amazing DFA label (LCD Soundsystem). Opening is Saxophone Juice (Reptar’s Graham Ulicny) and fan favorite, TBA. $8, 9:30 p.m. Tomorrow night, Almost Music in the Blackstone District is hosting a pretty cool in-store. Headlining is New Zealand legends The Renderers (Flying Nun, Merge, Siltbreeze, Ba Da Bing). Their pal Simon Joyner and his band are opening the show, along with Razors. $5, BYOB, 8 p.m. Fun! Also tomorrow night, Low Long Signal headlines at fabulous O’Leaver’s. Helping them out are Armful of Tigers and The Sleeperhits. $5, 9:30 p.m.
Hey, don’t forget the Punk Rock Flea Swap at The Brothers Lounge tomorrow (Saturday) afternoon from 4 to 8 p.m. Antiques, vendors, food, fun. More info here. Finally, Sunday night is the big benefit for Rene Orduna at The Slowdown. In addition to a silent auction, there will be performances by High Up, Simon Joyner and Closeness, and a special appearance by Dixie Drag. $15 suggested donation at the door, which opens at 6 p.m (music starts at 7). If you can’t make it (or even if you can), throw some bucks at the GoFundMe campaign.